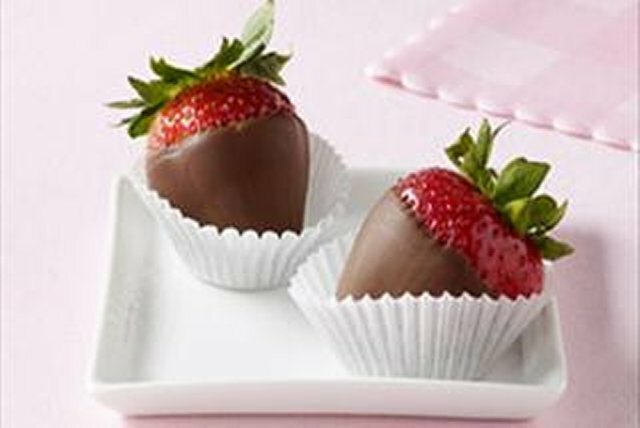 Is there anything more elegant than strawberries dipped in chocolate? If you're planning a Valentine's day menu for two, it makes the ideal dessert. Place chocolate in small microwaveable bowl. Microwave on HIGH 1 min., stirring after 30 sec. Stir until chocolate is completely melted. Dip bottom half of each strawberry in chocolate. Place on waxed paper-covered plate. Refrigerate until chocolate is firm. Store in refrigerator. Substitute 1 tub (7 oz.) BAKER'S Milk Chocolate or Real Dark Semi Sweet Dipping Chocolate for the chocolate. Melt dipping chocolate as directed on package. Strawberries can be dipped up to 6 hours before serving.